Mick and Corina Fogg. Photo by David Lansing. Orion’s expedition team leader, Mick Fogg, sat down at lunch with me today. He wanted to apologize for sending me on the Oyster Lovers Tour in Cole Bay when there were no oysters. Not a problem, I told him. There was nothing anyone could do about it. It was just the weather. Besides, I said, I got my oyster. “So I heard,” said Mick, laughing. I think I need to come back to Tasmania some time for that cruise. Mick’s gorgeous wife, Corina, is also on the ship. She helps out organizing the expeditions and does a hundred other tasks as well. Like everyone on board, she’s happy to help out wherever she is needed. Corina is also very pregnant (due mid-March). After we dock in Hobart, the Orion picks up a new load of passengers and heads off for an 18-day expedition to Antarctica. Mick and Corina won’t be on that voyage. They’re getting off with us in Hobart and flying home to prepare for the birth of their first child. And, penguins or no penguins, they’re both very excited about spending a little time at home and preparing for Corina’s upcoming birth. As well they should be. 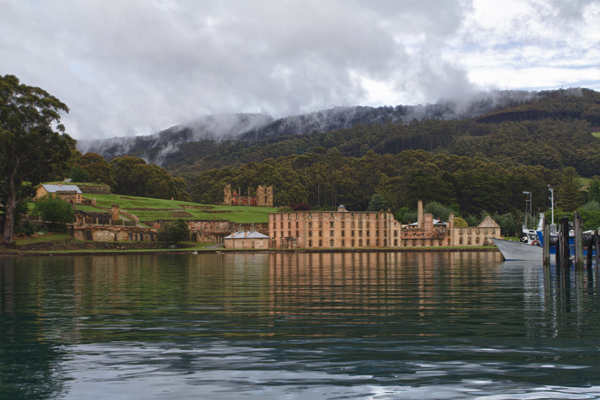 The prison at Port Arthur as seen from sea. Photo by David Lansing. I walked around the ruins of the prison and even sat in one of the brick-walled cells looking out at the harbor where whisps of low-lying clouds, like smoke, floated over the dark waters, trying to imagine what must have gone through the heads of the men who stared out at this same scene a hundred and fifty years ago. How hopeless you would feel. After touring the prison, we were given the option of taking a boat to the nearby Isle of the Dead where some 1100 of the convicts (most of whom died from respiratory disease in this cold and dank spot) were buried, but I declined. It was just too sad. 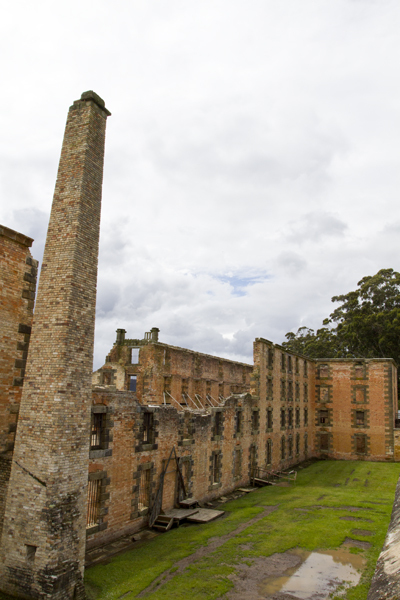 Port Arthur prison ruins. Photo by David Lansing. Just to be clear: Tasmania is 150 miles south of Australia. It is not a country; it is an Australian state. Like Victoria. Or New South Wales. It is the size of Ireland. Or West Virginia. Some say its profile on the map looks like a human heart. Others say it’s like an apple with a bite taken out of it. This reputation, unjust, is a result of its history. There were basically three types of Brits who first came to Tasmania in the early 1800s: convicts, prison wards to guard the convicts (who were often ex-convicts), and the black sheep of British aristocracy; usually men, but sometimes women, who had made a mess of things back home or were disgraced for one reason or another and were quietly sent packing to this secret, rarely visited island, where, it was hoped, they might make a fresh start. Sometimes they did; usually they didn’t. The most interesting Tasmanian story to me is the island’s role as a dumping ground for convicts from all the U.K. colonies. In the fifty years from 1803 to 1853 some 75,000 convicts were transported to what was then called Van Diemen’s Land. That’s a lot of convicts. Particularly when you realize that according to the census of 1847, the island’s total population was around 70,000 people; of those, it was estimated that just over 50% were, or had been, convicts. 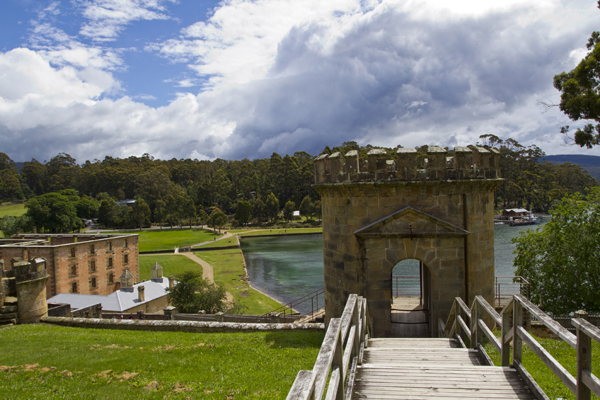 I mention all this because this morning we dropped anchor in Port Arthur, without doubt the most notorious penal station in Tasmania if not all of Australia. From 1833 to 1877 it was used as a punishment station for repeat offenders from England, Ireland, India and Australia. They say that even today, there is an air of sadness so strong hanging over the former prison grounds that it is palpable. No doubt it will be sad. But it’s something I feel I have to experience. The Orion bar staff. Ray is third from left in the black jacket. 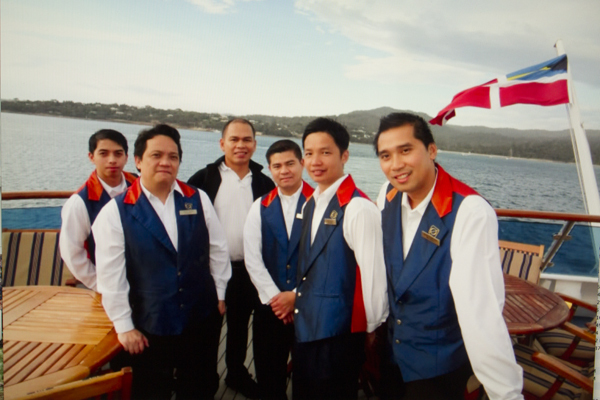 Just about everyone taking care of us on the Orion—waiters, bartenders, housekeepers—is Filipino. They are the most gracious people in the world. I’m particularly partial to Ray who makes me a latte every morning before I even ask for it and gives me a particularly generous pour of Tasmanian Pinot Noir in the evening. These people seem born to smile and seem genuinely happy to be doing their jobs. Despite the fact that they are thousands of miles away from their villages and families and, on average, work for four months solid on the ship before going home for a break. Let’s face it: It’s not an easy life. So I have very confused emotions about the staff. I like them, I respect them, I appreciate what they are doing for me. But, to be honest, I also feel more than a bit embarrassed when they address me as “Sir David,” or when I see them setting up the dining room at six in the morning when I know they were still working at eleven last night. Here’s the other curious thing: Almost the entire Filipino staff wears badges bearing Anglicized names. Ricky, Ray, Eric, Alex, Charles. Would a Filipino mother in a little village in Cebu or Batanes really name her baby boy Alex or Eric? Or is that just the name they take for themselves on the ship to make it easier for white boys like me to remember them? Last night when Ray came over to my table and asked me how my day had been while slowly pouring me a glass of Frogmore Creek Pinot, I asked him if I could ask him a question. 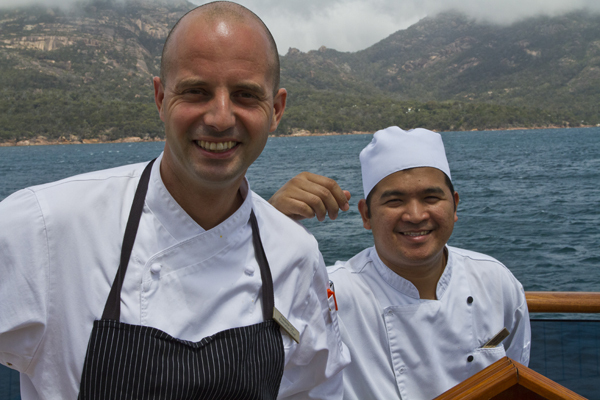 Executive chef Frederic Cyr and his assistant, Jay Sagana. Photo by David Lansing. 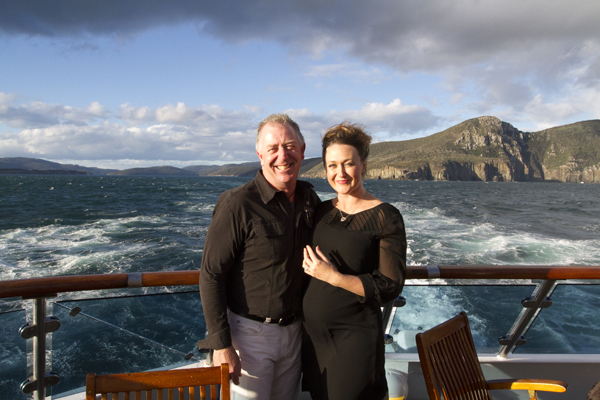 Since the Orion is providing us with a Tasmanian food and wine focus, and there are only 63 passengers, it probably won’t shock you when I say the food has been extraordinary. A sampling from the dinner menu: fillet of local blue-eye trevala; Cole Bay scallops in basil butter; slow-cooked loin of local lamb; olive oil poached Tasmanian ocean trout; summer salad leaves with Tassie blue cheese dressing. The key, of course, is that almost everything executive chef Frederic Cyr (from Montreal) cooks up is local. The seafood, the lamb, the produce, the fruit, the cheese, and even the wine. The dinners have been as good as you’d find in the finest restaurants in Australia and Frederic tells me he can do that because he is working with such premium ingredients and because he doesn’t have to make hundreds and hundreds of plates of the same thing. And I have to say that as excellent as dinner has been, I’ve also looked forward to lunch and breakfast—and I’m not a breakfast guy. I don’t really care about the omelette station or the toasted bagels with Tasmanian smoked salmon and capers (although certainly the other cruisers seem to appreciate them); what I look forward to is a big bowl of fruit. It’s extraordinary. I can’t remember the last time I had honeydew melon that tasted so, so…well, honeydoish. I mean, I just linger over every bite. Same with the rest of the fruit, which is almost all coming from local sources (remember that it’s the start of summer down here), right down to the luscious Bruny Island strawberries. So good.